Paging systems broadcast a short paging message simultaneously from many tall base stations or satellites transmitting at very high power. Systems with terrestrial transmitter are typically localized to a particular geographic area, such as city or metropolitan region, while geosynchronous satellite transmitters provide national or international coverage. In both types of systems no location management or routing function are needed, since the paging message is broadcast over the entire coverage area. This high complexity and power of the paging transmitter allows low-complexity, low-power ,pocket paging receivers with long usage time from small and lightweight batteries. Early radio paging systems were analog 1bit messages signaling a user that someone was trying to reach him. 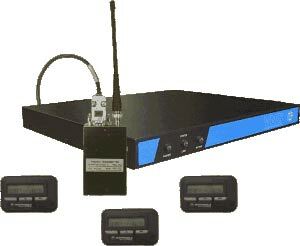 These systems required callback over a landline telephone to obtain the phone number of the paging party. The system evolved to allow a short digital message, including a phone number and brief text, to be sent to the pages as well.